More good news for Federer fans as Roger made it into the Semi Finals in Hamburg, albeit unconvincingly, defeating Florian Mayer 7-6(4) 3-6 7-5 to setup a clash with Federico Delbonis. In my prediction I thought Roger was getting this done in straight sets but Mayer put in a dogged display and proved a very tricky customer. He was of course assisted by Roger making a string of errors and poor service games to ensure this one went deep into the third. There were also a couple of signs Roger wasn't moving too well which was a slight concern, he wore a tank top for the entirety of the second set despite the temperature been around 19 degrees and then didn't even sit down before he served out the match 7-5 in the final set. Not sure if there is anything to read into and I'm not one for speculation but he wasn't looking great either physically or mentally and the two are usually linked. As has been the case this week it wasn't the cleanest display from Roger as he struggled in the first set to really dominate but there wasn't really many key points as both guys were holding serve and looking solid. It of course came down to a tie breaker and Fed managed to string a few points together to take it 7-4. It wasn't a bad set from Roger but he just didn't look totally comfortable out there and was struggling to get going. The second proved that as he soon fell 5-1 behind which was pretty poor, he did however win the next 2 games and I thought for a minute that Mayer was going to let him back into it but he eventually closed it out 6-3. As I said above it was strange that Roger played this set with a tank top sweater on even though the temperature was still pretty high on a warm summers evening? Like I said I have no idea on the reason for that, clearly not tactical or performance related though. Heading into a decider I had no idea which way it would go as Mayer was playing pretty well with his unorthodox hitting proving difficult to read or counter. Roger started the better of the two going up an early break, which he relinquished immediately before breaking again only for the exact same thing to happen. It was disappointing that he couldn't consolidate and really he only has himself to blame, breaking serve twice in a set should always be enough to take it yet errors and misjudgment cost him both times. It actually looked like Roger was moving rather gingerly towards the end of the third set as he looked quite upright and stiff but seemed to come back to life a little at 5-5 in the third to break before finally serving it out to get the job done 7-5 in the third. It looked like a match that could have slipped away so it was pleasing to see him dig it out at the end despite not playing that well. Overall I'm not sure what to make of this one, I wasn't fully focused throughout as I was at a BBQ and watching on a laptop outside so I wasn't fully engaged for all of it. When I was watching though I wasn't overly impressed with Roger's game as he was pretty error strewn. If anything the backhand was more solid than the forehand which isn't what you'd expect. Maybe that's just down to the racquet change but he wasn't really moving too well today or serving well either which are integral to his game. I'm not sure about the back but it was strange how he wore a vest and wasn't looking to great on his feet. Perhaps it was just precautionary though or a minor twinge, guess we shall see what comes out in the pres conference. The positive is of course the victory and getting through a tight match where he wasn't particularly at his best, it was almost Roger 3.0 like but at the same time it's rare you saw Roger 3.0 lose his serve 5 times in a 3 set match so I'm not sure what to think. But anyway, it's a win and I'll take that for now, it's difficult to read too much into it at the minute as he's still in the tournament despite playing with a new racquet; a comfortable victory tomorrow and the Mayer match becomes somewhat obsolete so I'll just wait and see. 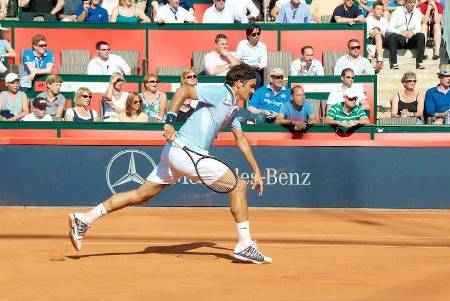 Surprisingly Roger's next opponent is Argentinian Federico Delbonis who defeated Fernando Verdasco in 3 sets. It's quite amazing how yet again the draw has opened up and Roger has definitely had the rub of the green over the last few tournaments. Many thought he'd be facing Janowicz, I predicted Verdasco but now he's facing a Qualifier for a chance to make the final. Quite bizarre. On paper this is going to be one sided as although they have never met, Delbonis hasn't really done anything of note or won any titles. He is only 22 though so has plenty of tennis ahead of him but Roger should be beating him comfortably. I guess you never know though, he wasn't exactly scintillating today and has little recovery time if indeed he was feeling a little pain in the back but I'll back Fed in straights 6-4 6-4. You, Sir, have no right to claim the title as you’r not qualified. You did not watch the match and played tennis instead. That’s a misdemeanor. I’ve already explained your legal options in a prior post. Consider yourself served. May the readers of PeRFfect tennis be the jury. Charge: Mr. Simon did not watch the Roger Federer match. Instead, he played tennis and returned to brag about it. Furthermore, he mocked the fans by claiming the title. We are charging him with aggravating Federer fans. Note that we already had an acquittal in the PeRFect Tennis vs. Jon case as a first time offender but Mr. Simon hasn’t learned from it. Mr. Simon has pleaded “not guilty” to all charges. Each one has to respond to this post with the words “GUILTY” or “NOT GUILTY”. In case of a tie, I, Sid, a.k.a TheCookieThief, a.k.a. Judge Dredd will make the final decision. Exhibit A: PeRFect tennis would also like to present evidence. 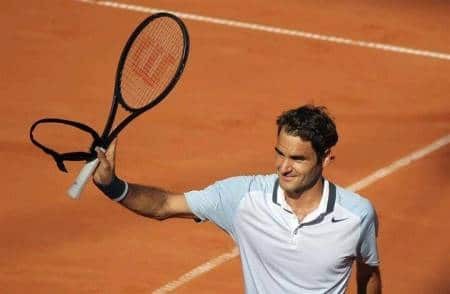 At the following link, https://www.perfect-tennis.com/federer-defeats-hajek-in-hamburg/, search for Mr. Simon’s comment at July 19, 2013 at 10:12 pm. I was on the site 5 mins before Jonathan posted it, and went to watch the match highlights, came back – the post and all these comments popped up! Sorry Sid, I cannot give you my verdict. First I have to get over the fact that SIMON JUST CALLED YOU DRAMADAL !!! Of all the insults in the whole world, to be called that…… I feel for you Sid…..
And to finish you off he called you ….Nadull???? Oh man, of all the namecalling and insults in the entire world, to be called…..
Poor Sid. Bad Simon, bad bad bad Simon…. Chosen randomly?… Final who just said he should have been first? ?… No way! No rules mention that the match actually has to be seen (live or not). Therefore, the defense judges that there is no reason to actually BE in court, as there is no evidence of ANY rule broken! :-P.
And Katyani, you can’t be an impartial judge after calling me bad bad bad bad simon. And I was just responding in my way to Sid, I do not mean those insults. – jury wayyyyyyy too biased. Mr. Simon, I am your lawyer. Mr. Cookie Thief, may I call you Sid The? Yes, I expect so. Well, Sid The, you have to go through me if you want to speak to my client today. We plead not guilty of all charges, and furthermore charge the prosecution (highly irregular, I know) of submitting himself as a judge. If this is not intimidation of the jury, I don’t know what is. Statyani will have to give us a verdict or she will be tried of dereliction of jury duty. Mr. John, can you defend Mr. Simon’s transgression of the rule mentioned above in light of Exhibit A? We can also make a plea bargain and I’ll state the conditions. Mr. Cookie Thief, we change our defence and plead guilty to the charges brought about by yourself. However, we will still object to the trial’s validity on the grounds that the prosecution has appointed himself judge in this matter as well. The jury’s verdict has been given, and my client accepts it so long as Mr. Cookie Thief joins in his punishment, whatever that may be. And Mr. Simon, I’ve sent you my bill. Just so you’re not surprised, this hat was A LOT of money. Just thought I ought to raise a very important point. Simon is planning on visiting Gstaad. In light of recent events I think he is a flight risk. I only give up on this title as to not anger anyone on this blog. However, I do not plead guilty, and I give up john as he is a terrible advocate 😛 And I do agree to not have any air travel these next 4 weeks. Simon, I told you this when you hired me. However, there is still the small question of my fee. I will agree to waive the fee if Mr. Cookie Thief agrees to steal a cookie within the next month. And a well deserved one at that. Rest assured, Conal, that your rights will be protected from those who attempt to steal your titles away. We at PeRFect Tennis, hold these truths to be self-evident, that all commentators are created equal, that they are endowed by their Creator with certain unalienable Rights, that among these are commenting, and the honest pursuit of titles. And to that end, we shall ensure that the blog of the people, for the people, by the people, shall not perish from the world wide web. I, Katyani or as I am seeying here Statyani, FIND THE DEFENDANT SIMON…. NOT GUILTY !!! Simon: I don’t forget and I don’t forgive, but I am honest. You said that you did not like the color orange (knowing fully well that that is the color of my country) and you said that you did not like Tsonga (knowing fully well that I do like him). These things I do not forget and forgive. But I am honest……. you were first. Sid: No matter who the opponent is or how he became first, always shake their hands. Simon: No matter what the circumstances, never ever call someone else Dramadal or Nadull. That is low dude. Sid: It is not bad if someone does not watch a Roger match. Can happen. Have to work, have to sleep, traffic jam, have to play tennis themselves (is valid, nothing wrong with that) or maybe because it is too stressfull. Conal: After the fact happened, you come and claim the title? What is up with that? You were not the first. You were late. Period. End of discussion. Sid: You put my name first !!! Ahh, you like me, you really like me !!! Katyani: Wow, you are so good with your comment !!! You are a good and smart person. Ahh, thank you Katyani, how nice of you to say that !!! Sid: Beeing called Berdych is not as bad as beeing called you know what. Conal: You say guilty. really? You have no right. You say you could have been first. But you were not. Where is the evidence that you were first? No evidence, than stop your claim. Simon: Don’t call me impartial…. John: Well there come the vultures (lawyers). Sid: After I defend you and take the risk of making Simon my frenemy, you will trie of derel… me too?? This is the thanks I get?? How rude dude. John: Instead of helping a fellow Roger fan, you charge him for money?? How rude dude. Sid: You are in no position to give a verdict. Who is the Head-Juror, you or me? What I say goes, not what you say. Terms of the plea bargain not accepted. Sid: Simon is allowed to go to Gstaad. You cannot have the Goat in your own country and not see him. That is cruel. Simon: Never ever give up a title you earned. Oh and yes, good that you fired your lawyer. John: I hereby say that you should not get any money from Simon. If you do get it, it goes straight to the RF Foundation. Sid: Really, you take bribes? And say online that you will steal? Really?? Conal: If the title was not destined to be for you, it will never be yours. Shame on you. Next time, try to get it the honest way, by working hard for it !!! Sid: Know your place. You are not the boss. I am. YOU gave ME that right by putting my name first !!! So……. court is over. Simon, congrats on your title. What is yours, will always belong to you. No one can take that away from you, no matter how hard they try. You may leave. Katyani, nice work. The rest…… Shame on you !!! Holland, 21 July 2013. 06:50. Nope Conal. Not deserved. You have Simon’s trophy in your basement !!! Be a gentleman like Roger and give it back….. Karma will find you….. He was fairly awful today, new racquet aside. Played some Fed-like points but mainly was so un-Fed like it was scary. Movement is still not like it used to be. And I totally agree, he was walking strangely at the end and the look on his face saluting the crowd was not the look we’re used to seeing on a healthy (physically and mentally) Fed. Had a couple of bizarre-ly loud “come-on”s when he broke Meyer back at 5 all in the third which were, well, really bizarre. These are the matches that even last year wouldn’t take 40 minutes, let alone over two hours. I hate to say it, but he’s lost something. He’s pretty much the only reason IMO to watch this game anymore, and I hope he has something left, but as of late he’s not shown much. Yes agreed on the really weird loud come on’s! Usually he reserves those for VERY important points, lol this was just against Mayer! Did anyone really believe he was going to lose? Still, can’t quite believe he got broken so many times in a 3-set match! And as others have remarked, it was disappointing to see him relinquish the lead in the final set so many times, but par the course as a Fed fan! He needs to clean up his game tomorrow that’s for sure, but I really hope he’s OK physically. Movement was off in a big way. The title’s there to be won; Fed just needs to make an appearance! Hmm I dunno if Prime Fed beats Mayer in 40 minutes. It could still have been close as he’s a very tricky opponent. I was just more disappointed as it wasn’t a convincig win. Not bothered he dropped a set as Mayer was playing well, just a stuttering performance. I think he will win the SF but I”m not so sure about the Final. Yeah, I think he will beat Delbo too but not sure on final, Fognini is good form. Least it looks warm out there today. After I watched the rerun, he defo looked stiff… hope it’s just something minor, and that he’ll blow the next guy off court tomorrow! Yeah, I guess the fact he stepped on court today proves it isn’t serious. Come on guys! I predicted a tough match with at least a TB and so it was. Mayer v tricky. Good news, Fed came thru, had an excellent workout and had to dig pretty deep. Still in tournament and has played 3 gd matches with new racquet! Potential bad news, the cold affected his back yet again! However, that long rally at 5-5 0-30 indicated he was pretty ok, and his hunger showed with his v loud Yey when he earned the BP’s. Delbonis may be a bit weary after his v long match so if Fed gets his back sorted, then Fed in 2 sets. Still think he will make final to face Fognini, currently on a roll! Delbonis looks like he has some weapons. Could be interesting. Don’t you think Delbonis looks a bit tired? Well I did, but he clearly wasn’t lol. It was sort of a weird day, wasn’t it? Verdasco lost after being 5-2 up in the 2nd set tie breaker; Haas lost to Fogini in straight sets when he wasn’t supposed to, and Roger played a very uneven match. I think roger struggled for control early on in the match. Then in the 2nd set from being in a strong position with 2 breaks points up his sleeve, he suddenly find himself 2 breaks down. And after that for the next 1hr or so it was sort of a roller coaster ride with a splattering of some amazing shots from Federer. After the match on various other blogs i read rumors about back problems. Hope he is OK.. This is pretty much of an apt description on my feelings. Yeah I can’t weigh up the match, dunno if I was downbeat or happy he pulled through a tough one. Anyway, he got the win. other than Wimbledon i”ve never seen him wearing a sweater. Saw him play in a black sweater for the first time ever..!! I also thought he was walking funny mainly on his right leg. Otherwise I thought his usual good shots were overplayed and some of his poorer shots were better than usual. I was hoping this was due to the new racket. It was the best match Roger has played in ages, maybe since Rome. 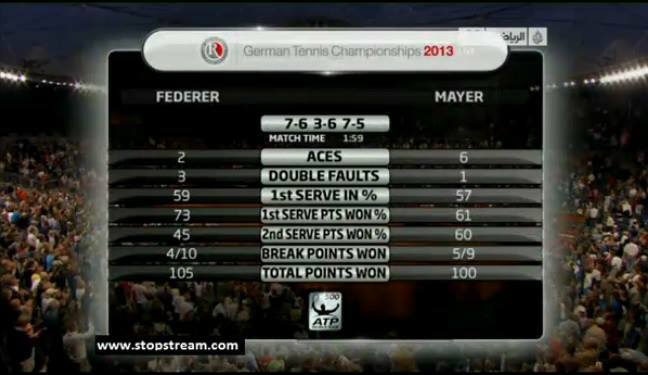 Mayer was great so good on Fed to hold him off. Now that I replay it in my mind, you’re right, it definitely was a great performance in a long time. He seemed to have a belief in the third that, “I will not lose today”. For a while, it seemed like his racquet had a mind of its own. Hello all! I have been reading a lot about the mach with Mayer! I did watch the entire match and it was indeed a rollercoaster ride. I ended up yelling by myself in the house, and in the end i felt relief and some sort of good old fashion epic-Federer-match. I really do not see why most of you are saying he played poorly at times. Mayer was all over the place. It was a really good and difficult match. Fed wanted this victory. Finaly he is determined! Most of his shots are super clean and placed on the line. Shots that we have not seen in a very long time. His powerful roar in the third made me jump of my chair! Allez! Hmm I think that’s taking it a bit far. Dropped serve too many times for it to be one of his best. The positive is definitely the win though as he could have easily lost. I class it as a scratchy performance. But confidence boosting all the same and hopefully the back isn’t a problem. Oke, was anyone else surprised that Fognini is such a good player? Wow, he played some amazing shots. Even Haasi could not keep up. Lost in straights. Roger was good, then not good, then good, then not good, until he finally won. Something is wrong, but I say lets keep faith, this is only his third match with the bigger racket. I find it more worrying that he has to play the SF in the afternoon or midday (?? ), I mean early, which gives him not that much time to rest…. Oh come on, don’t be comparing a 26 year old with Haas. Haas has being putting in a lot of effort recently so a let down is expected. Playing around noon could be better for Roger’s “back”. Besides, Delbonis might be a bit fried too after his three setter. No surprises around Fognini, he’s got an interesting game, talented player. Made French Open Quarters before so clay is his favourite surface. On a rare note, Roger’s socks were dirty for the first time! All’s well that ends well, glad he served it out to love (or maybe 40-15, don’t remember), and did not have to much trouble at that end! Haha didn’t notice the socks! A wired match with some brilliant shots and hopeless errors from him. But I was pleased to see him still wanting to win and he toughed it out. For that reason it was a great result. And he said he ENJOYED the match…..you’re kidding me, Roger? Yeah, scratchy level but confidence boosting win. The answer is simple: it was really cold, not a real summer evening. I’ve been there and I was really freezing with just a tshirt on me. Everybody around was wearing long sleeves and jackets. Outside the arena was better, but somehow at the field level was chilli and a bit windy. Cheers for the info Bogdan. I thought it was gonna be warm but guess not. I was playing tennis myself, got back just in time so glad they played for as long as they did! I haven’t been able to watch any of Roger’s matches this week until the weekend now since the timing in Europe is too early in the morning, I have work and I’ve been packing to go overseas in the next few days. I did happen to however catch the Mayer match. Obviously not the best match but I was pretty pleased that Roger 3.0 turned up in that third set. Trudi summed it perfectly above that we just don’t know which Federer comes out and play anymore and as a fan that makes you quite uneasy about matches he was winning this time last year. But credit to the man for winning yet another match in such a situation- confidence will be brimming. The only question I ask now is about the back. Roger wasn’t smiling after he greeted the crowd like he usually does. I’m definitely concerned, he looked stiff but no one knows the extent to which it could be aggravated, does anyone have his presser? Anyway, he’s done fairly well with the new racquet so whatever happens in this tournament is a good result so far, especially if there is an injury concern going on. The sweater vest was pure genius might I add. Jonathan, Fed has been having back issues really from Rotterdam I think this year, this has been an ongoing issue perhaps for the last few months, he hasn’t played that many matches this year either so I’m wondering why Fed has tweaked it so consistently this year- is it mileage catching up or was it something that happened in the moment? If Roger fails to win either of these clay tournaments, I’m not looking forward to the rest of the season, new racquet or not. First of all, where exactly is Jonathan? The mileage surely has to catch up, there is no doubt. Time forgives nobody. Not even the GOAT. That’s precisely why he went for a bigger racquet. It won’t take that much out of him. He still hasn’t adapted to it yet. I’m telling you, once he has figured out the right combination, he will be a delight to watch. We can already see that the backhand is better. I haven’t seen any presser Alysha, will try find it. Maybe his back is to do with tweaking or trapping a nerve, might aggravate it when it’s cold or something. Pretty sure it’s not muscular. Started in better form against Delbonis though, hitting some sweet backhands. Annoying he got broken back though. Wow! Almagro’s backhand is sick! I just watched a replay of the match on a pay TV channel with no TV-ad breaks. What was odd is that Roger did not sit down on some change overs, especially in the third set. Weird. Must be connected to the back problems. Phew, a set and a break down would have been interesting…. Delbonis is playing pretty good isn’t he? Also, it seems like feds is blocking a lot more returns on his backhand side rather than slicing it than before the new racket. Thoughts? The slice ain’t working against this guy. He is really bending low and getting it up. Sore of like the slice against Nadal’s forehand. I`m just dying on the inside… He can still do this, although he really seams frustrated. Delbonis IS playing pretty good. Don`t know what else to say. Hope he comes trough. What sort of thing is happening here? Am I the only getting a tad nervous here? I could lose it any moment. Roger looked irritated too but hopefully he will get calm after that hold. It means, “Federer has the final in sight? Not really”. Unfortunately. What can I say, that guy is a beast. This is why people (like Roger said) should not hype things. They thought it would be a Roger/Haasi-Final, now both are out. Kudos to Delbonis. Nice guy. For me personally, still cannot believe Fognini plays this good and is in the final…. Translation: Federer has the final in sight. Not really. He lost. Still love him. I just… I`m so sad. That was the heading in a newspaper they showed on TV. Should be beating Delbo though for sure. Poor match, another scratchy performance. Gstaad, right? Though I’m not sure what to expect. Roger looked spent. He may be spent, but he has about a week to get back on track physically. He played 4 days in a row, I think. He looked bored and disappointed. Might be torture for him this. And his opponent of today played just a tad better…. No, Delbonis played really good. Great lateral movement, great knee bend to load, great preparation, super forehand with lefty patterns, super backhand, very good serve, nice touch at the net for a big guy…I don’t really know what Roger could’ve done. The only weakness, very sharp short angle shots. Add to that the fact that Roger was erratic but that was a direct result of what Delbonis was doing. No complains. No excuses. Lost to a much better player today. Racquet did not withstand the test against a big hitter but it can only get better with time. I think it is, Simon. We’ll get back to that discussion soon. I’ve been 10 meters from Roger and my feeling is that the raquet does sound a bit strange. I feel the string tension is still a work in progress because sometimes he plays flat, sometimes ge plays top spin and sometimes just high balls. The forehand is not consystent at all. Hey Simon, if Roger makes at Gstaad the SF or Final, that will be enough for me. Very dangerous players, even with Stan. The “Swiss number one?”. And today was only his fourth match with the bigger racket. We all did hope he would make atleast the SF, well he did. Should also have won, but didn’t. I can tell you what to think – but you probably don’t want to do that until the end of the year. The signs have there for more than a year for those who have eyes to see and are willing to open them. Too many people prefer to keep theirs shut and deny the obvious. Haha! Good one. What this troll doesn’t realize is that everyone has a down year. Nadal has had a couple of down years. Djokovic had a lull in 2012. If Roger had a good 2012, it’s likely he won’t have a good 2013. I said that a long time back that “2013 will not be kind to Roger”. That was my expectation as a fan. Federer himsefl said this year would be a transition year… I think 2014 will be his. Wimbledon 2012 WAS more than a year ago, Scooter. Learn to count! Well, technically, less than a year ago, Roger was still No.1. Arif….. sigh….. just let the man be…. we as humans have no right to deny someone his pleasure. The man loves to play tennis, so let him. He loves it now, is losing, will still love it and will win. Simple. He has to work on it and for it, but don’t go there with the retirement again. Let him play. Hey stupid Arif, you are the ones who was forcing your beliefs on us Federer fans by saying that we are cheerleaders, and we should wake up etc. etc. etc. I’ll have to go back to your older comments to find out the exact words. So, the point is, if you believe in something, that Federer is done, finished, why are you hell bent on forcing it on others? And you’re persisted with that theory of yours despite our repeated request to let us be the way we are. Isn’t that the behavior of a fundamentalist who simply refused to back down from what he believes and forces it on others? It literally kills me to watch fed struggle through matches like these… These are the sort of matches which he would have wrapped up in less than an hour last year. Exactly! If he plays like this against Delbonis, how will he withstand the top 4? This match went as planned until Delbonis made the re-break in the first. I`m gonna go drink some beer now, cause I`m to bumed out to do anything else. Thanks Sid! Means a lot. 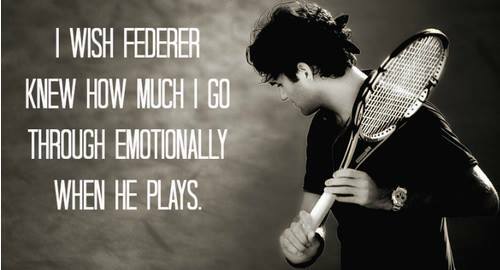 I just miss the visual poetry signed by Federer. Hey Tilas, like someone on Ru-an’s site wrote, even the Great Roger Federer cannot pick up a new racket and start demolishing opponents !!! It takes time. Lets hold on to that and lets give Roger that time (that, to be frankly, he does deserve). Same here, I was safocating throughout the match and wanted to quit watching…I know we shouldn’t expect an instant great result from new equipment but not for this level of struggle. Sad to see him go like this, though I was impressed by Delbonis. b) He switched racquets after ten years. That’s huge. Really huge! d) It’s clay for crying out loud! I’m not making excuses, but that’s the truth. Hey Sid, thanks. Maybe I was a bit too emotional, you know I’m a girl…not so young though. You are right. The change of racket IS huge. He needs more time, I know. Although the cold weather didn’t help, a bigger racket might caused the stress to his back, too. And this Delbo guy played great with some delicate touch and calm attitude, I was really impressed. ‏@Am_Rothenbaum Roger #Federer does not want to make any excuses (back e.g. ), only says need to get more rhythm and that conditions were dif. to last night. Definitely yes: yesterday evening was VERY cold, today was over 25 (maybe 30) with clear sky and a lot of light. This ia not an excuse, just a fact! Ok, who agrees with me. Sure, it’s clay but I sort of like this Delbonis guy. He really is a hybrid of Nadal, Del Potro, and Murray. He seems to have a very down to earth attitude too. He is just 22 so there’s plenty of room for improvement. Will be interesting to see how he does on hard courts. He was good, made some nice volleys too and played well when it counted. Wasn’t under too much pressure but he closed it out well.